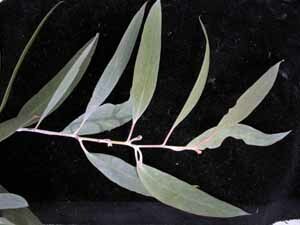 Eucalyptus tenuiramis (Silver Peppermint) is an uncommon, distinctive eucalypt that grows on very dry, fire prone areas of south-eastern Tasmania, especially on Permian mudstone. 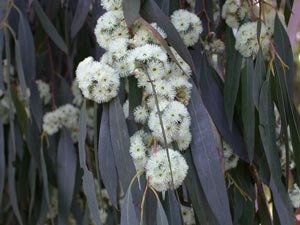 Its distinctive features are it very glaucous stems and young leaves, and smooth bark. 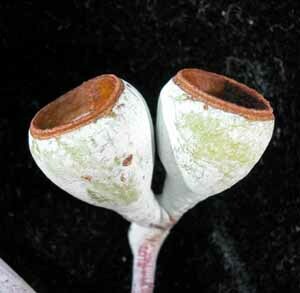 It is very closely related to E. risdonii (in fact, these two species are extreme forms of a continuum, with E. risdonii being a form that does not make the transition to adult foliage). They are members of the peppermint group of species, which also includes E. amygdalina, E. nitida, E. radiata, E. coccifera and E. pulchella.